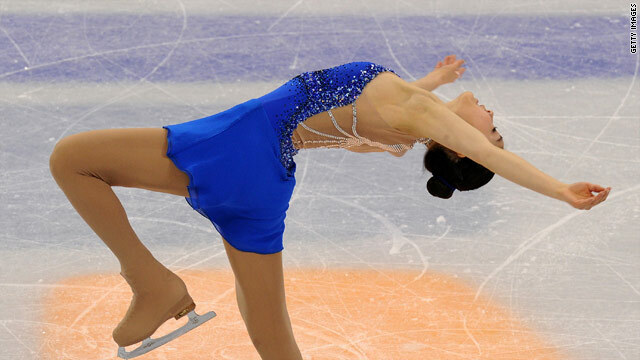 South Korea's Kim Yu-Na competes in the women's figure skating free program. Kim: "I have been dreaming about this moment"
Kim coach: "She embraced the entire Olympic experience"
(CNN) -- South Korea's Kim Yu-Na performed a flawless free skate on Thursday to handily claim Olympic gold in the women's figure skating finals and earn the first figure skating medal for her country. Kim, who led after the short program earlier this week, defeated Japan's Mao Asada, who won silver. Canada's Joannie Rochette, who competed just days after her mother died, won the bronze. "I have been dreaming about this moment and I can't believe that this moment is here," she said afterward. Kim won by 23 points, a huge margin in figure skating, reaffirming the 19-year-old's status as world champion. Skating to Concerto in F by George Gershwin, she breezed through a triple lutz, triple flip, triple salchow and the combination of a triple lutz and triple toeloop. She said she was shocked to see her score -- a 150.06 for the free skating portion. Her final overall score was 228.56. "I waited a long time for the Olympics, and it feels like a large weight has been lifted off," she said. Her coach Brian Orser said Kim has been calm throughout her Olympic experience. "She embraced the entire Olympic experience," he said. "It's everything I'd ever imagined for her. To see her live, it is sensational." South Korean media celebrated her win, with headlines reading: "We are proud Kim Yu-Na, nation 'jumps' with golden performance" in Sports Seoul and "Netizens emotional: We write Kim Yu-Na and read it goddess" in My Daily Sports. "The whole nation was watching, even the president," journalist Brett Cole told CNN from Seoul. "The whole nation literally stopped for Yu-Na's performance." "There was a lot of pressure on her because South Korea really wanted this victory," he said.